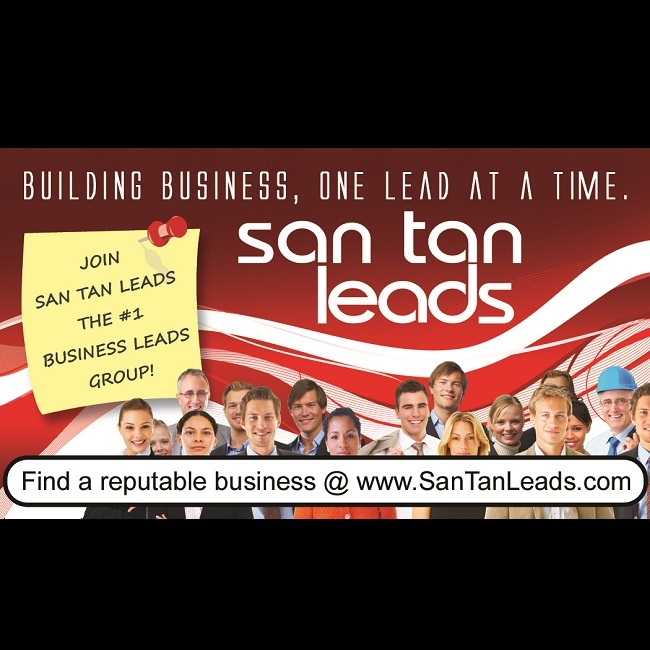 San Tan Leads is a one person per industry leads group located in San Tan Valley, AZ. Many business owners and sales reps join networking groups with the goal of selling their product or service to the members of the group. While working with other members in San Tan Leads is a bonus, it is not the goal. San Tan Leads allows business owners and sales reps an opportunity to teach the other members of San Tan Leads, how to sell for them. Each week, members are asked to present a tip, product or idea that helps the other members learn more about his/her business. The 60 second commercial is used to teach, not sell, the other members. When our members learn about product specifics, how to overcome specific objections, buzzwords to listen for, etc, our members can suggest solutions to their family, friends and clients and generate quality leads. It's easy to refer a Realtor when someone asks for one. Our members however learn how to suggest a Realtor as a way to solve a problem a potential client may have proactively. If you want to learn more about San Tan Leads and how together we build business, one lead at a time, visit us as a guest during one of our weekly meetings. Questions about San Tan Leads? Please call 602-443-0073 or click here. While we normally meet at Denny's (Hunt Hwy & Gary), we do go on field trips from time to time, so please be sure to check our website - http://santanleads.com for our meeting location. So happy I joined San Tan Leads! I am so happy that I decided to join San Tan Leads!!! The people in the group are great and have made me feel so welcome. It has also been helping me to feel more comfortable talking in front of people which is a must in my business. Absolutely the best move I made! Absolutely the best move i made for my business (Crown Carpet Cleaning 602-770-5002)...love SanTan Leads group! Great group of professionals! I have never been part of a better network group. 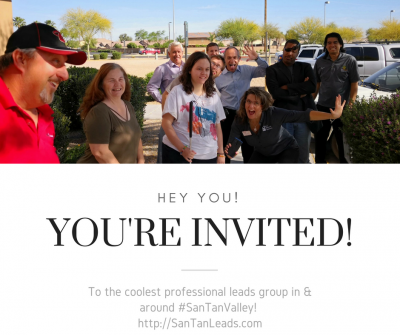 This group is not for the timid, if you need new business and want to get to be part of something special then San Tan Leads is the group for you.